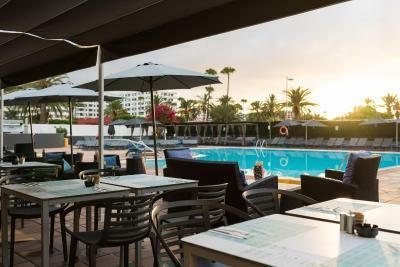 Lock in a great price for AxelBeach Maspalomas - Apartments and Lounge Club - Adults Only – rated 8.4 by recent guests! The Axel team were fabulous! 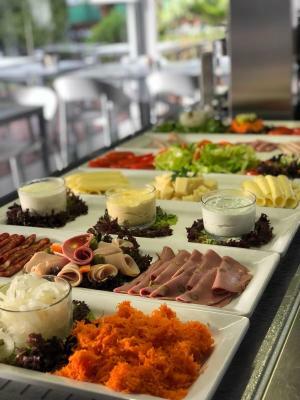 Friendly, professional and always happy. A very fun and welcoming hotel. 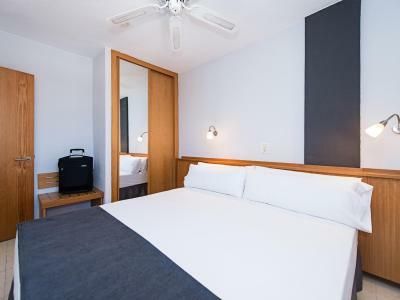 Nice clean new hotel. 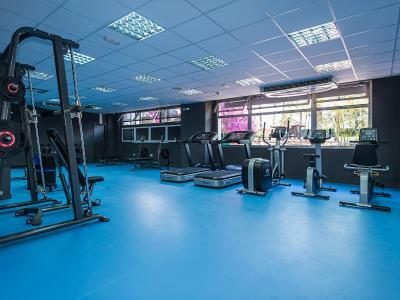 Excellent facility. Well maintained. Great location. 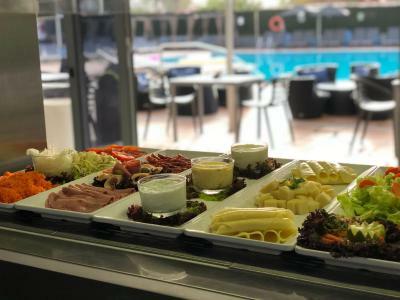 Great and helpful easy-going staff makes you feel welcome I this heterofriendly adults only hotel. Facilities were really nice collection of apartments, pool and hammock area, sauna, jacuzzi, gym, barber, massage room - clearly an effort for something different. 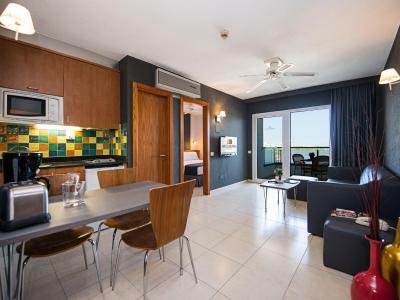 Rooms clean with quite basic furniture and kitchenette, nice to have separate bedroom, nice balcony. 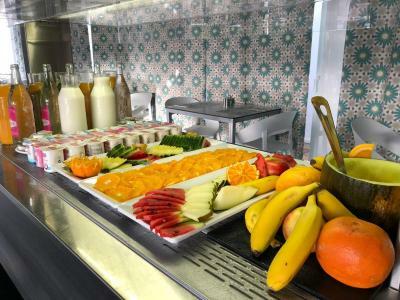 Amenities in the bathroom and by the bed useful... Breakfast really worth the price and nice start of the day with cava. Saturday Pool event was entertaining with beautiful Destiny :-) and bunch of great men staying at the hotel. I bet when the weather is warmer it would be a blast! Location is optimal and allows walking to dunes or Yumbo. Definitely coming back if in Ingles! Location, hotel services, ambience. Very friendly and helpful hotel staff. Thank you very much Front desk manager Ivan for all the help! Loved Antonio, who checked us in. He's superb. Loved that the property had a double bed (this seems rare compared to other hotels in the area). The roons were always kept immaculately clean. I'll be back. 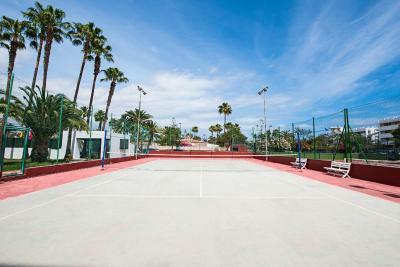 Location is perfect and about a 5-7 min walk from yumbo centre. 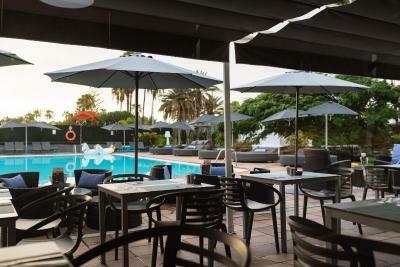 Pool area was spacious with more than enough sun loungers. The staff was very helpful and made me immediately feel like at home. Special thanks to Pancho who helped me during check-in. Cute room, spacious, and even though I didn't make use of it, I like the pool, I've been here before. 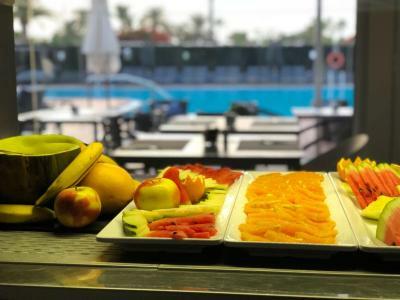 Great staff, amazing area near the pool, comfortable bed. 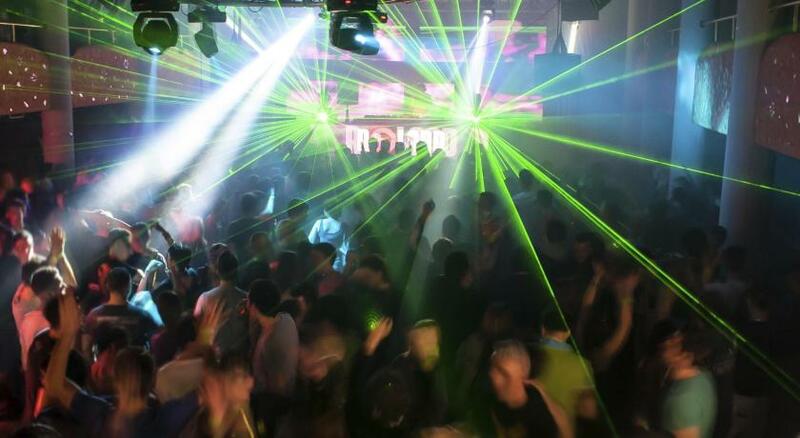 Great location, excellent friendly and helpful staff. Lovely room suite with balcony and great views, great grounds. 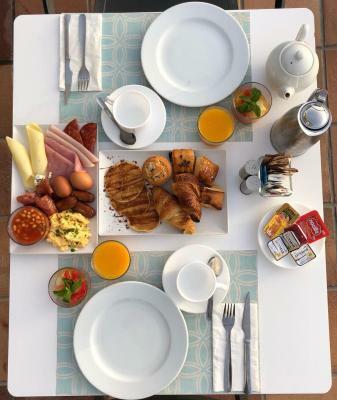 Nice breakfast with good choice. I'd certainly come again. 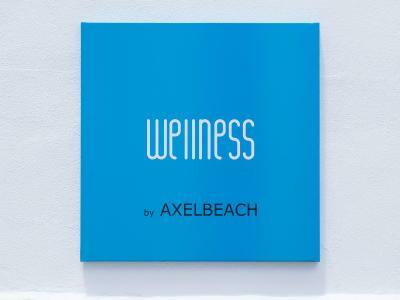 AxelBeach Maspalomas - Apartments and Lounge Club - Adults Only This rating is a reflection of how the property compares to the industry standard when it comes to price, facilities and services available. It's based on a self-evaluation by the property. Use this rating to help choose your stay! 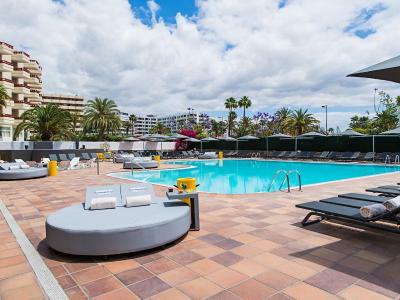 One of our top picks in Playa del Ingles.Within 1 miles of Maspalomas’s sand dunes, AxelBeach Maspalomas - Apartments and Lounge Club - Adults Only features an outdoor pool, gym and tennis court. 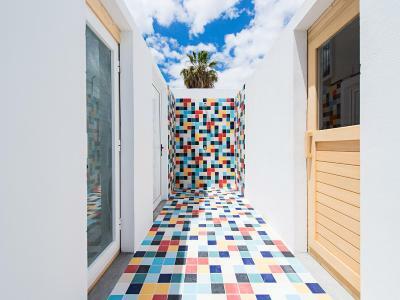 This gay and hetero-friendly, adults-only complex also has a hammam, hot tub and sauna. 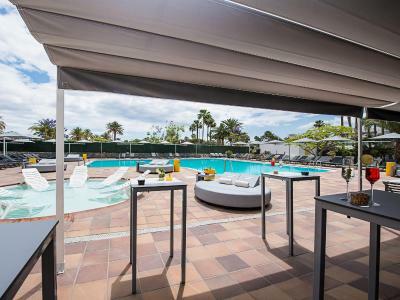 Opening onto terraces, the apartments at AxelBeach Maspalomas - Apartments and Lounge Club - Adults Only have attractive, contemporary décor. 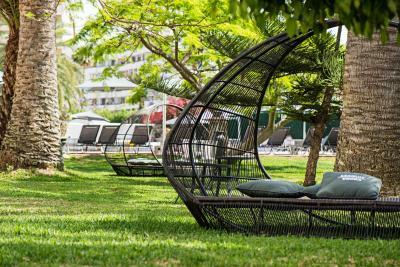 All include air conditioning, a safe, free Wi-Fi and a comfortable living area with a sofa and flat-screen satellite TV. 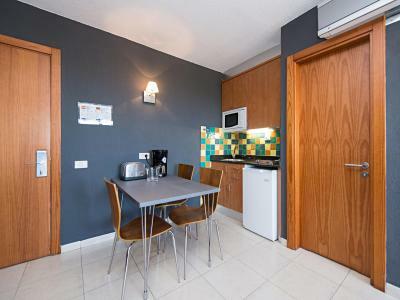 The kitchenette includes a fridge, microwave, toaster and coffee maker. There is also a dining area. 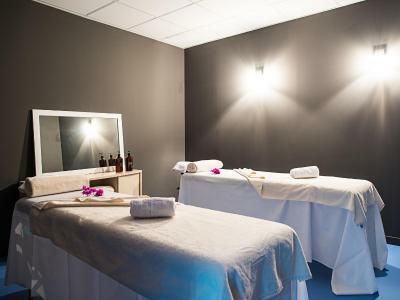 The property offers a massage service, and there is a hairdresser's and barber shop on site. The apartments are in a central, commercial district, a 5 minute walk from Yumbo Shopping Center, bars, restaurants and nightclubs. The nearest bus stop is just 350 feet away. 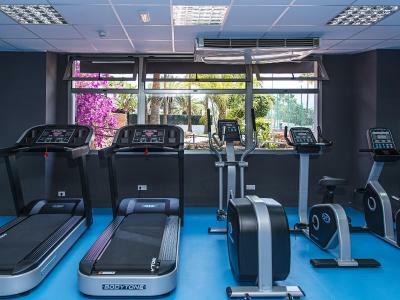 You can also arrange bike and motorcycle rental at reception, and a golf club can be found nearby. 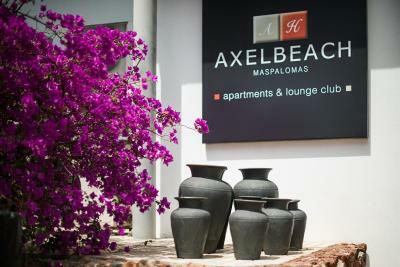 When would you like to stay at AxelBeach Maspalomas - Apartments and Lounge Club - Adults Only? 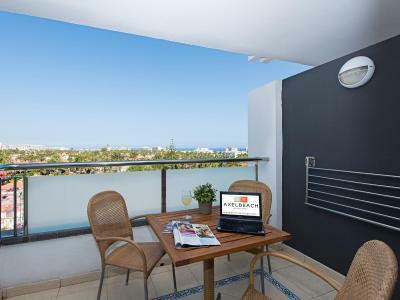 This apartment has attractive, contemporary décor, and includes air conditioning, free Wi-Fi and a comfortable living area with a sofa and flat-screen satellite TV. 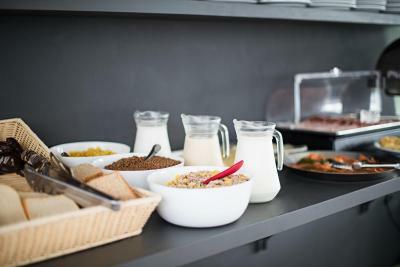 The kitchenette includes a fridge, microwave, toaster, coffee maker and microwave. There is also a dining area. There is a double or twin bedroom. This apartment features a living-dining area with a sofa bed and a flat-screen TV. The apartments offer a view of the main avenue. 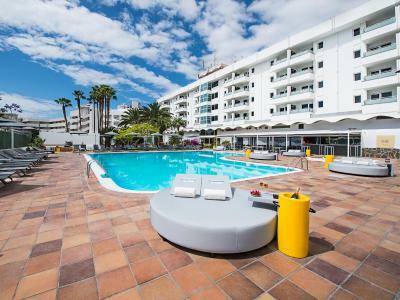 Offering pool views, this apartment features a living-dining area with a sofa bed and a flat-screen TV. 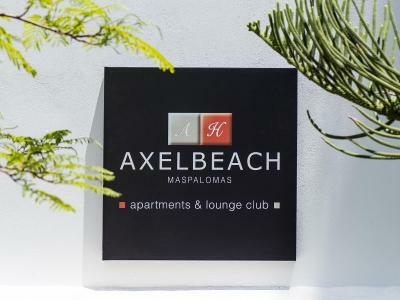 AxelBeach Maspalomas - Apartments & Lounge Club offers the best experience and fun of the island with the best atmosphere, facilities and leisure so that you can enjoy your holiday in Maspalomas, both day and night. 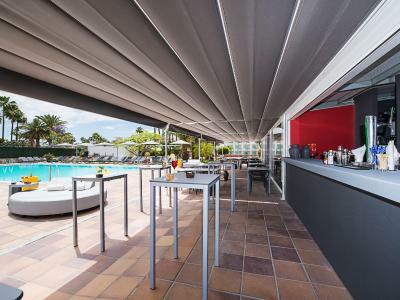 The complex, for adults only, has also several leisure areas conceived and designed exclusively for you to find the Axel cool atmosphere and the most cospomolitan meeting. 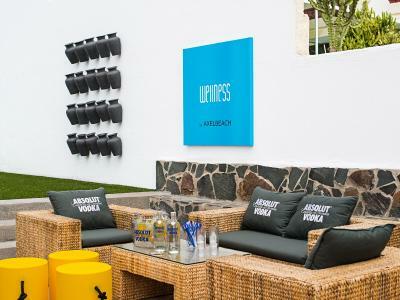 House Rules AxelBeach Maspalomas - Apartments and Lounge Club - Adults Only takes special requests – add in the next step! 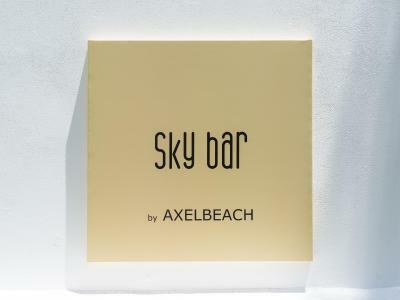 AxelBeach Maspalomas - Apartments and Lounge Club - Adults Only accepts these cards and reserves the right to temporarily hold an amount prior to arrival. Very friendly staff and clean room. 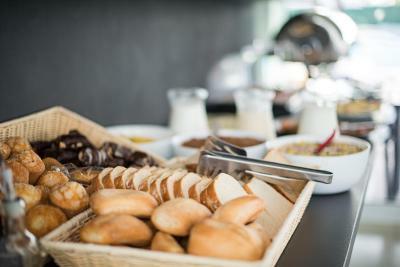 Extended breakfast untill 11 am. 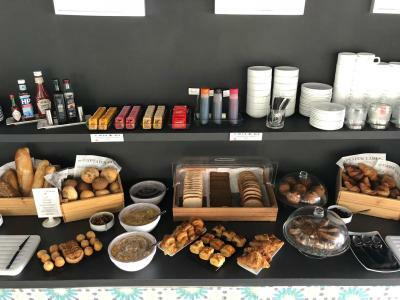 Breakfast is OK for the price, but could improve. 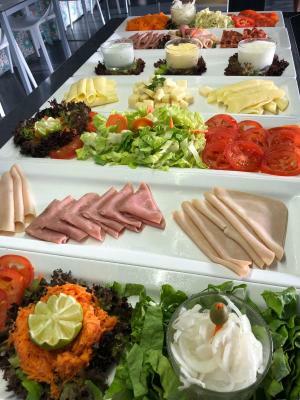 Nevertheless there are many cafes nearby where you can have breakfast or brunch. Great gay hotel next to Yumbo but away from the noise. Great pool with music and bar. 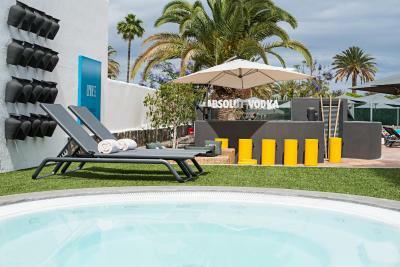 Chose the rooms poolside if you can. 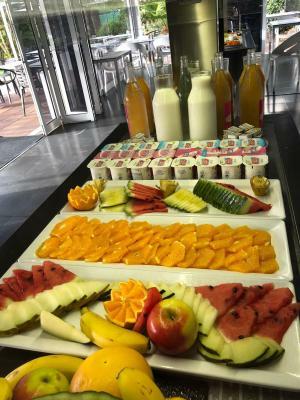 The staff and place are fantastic and nehira on reception is so helpful. She is always happy to see you and always helpful. Great member of the team being front of house. Victor with massage is great and its a great way to start the holiday. My room is always great and always seem to get my favorite 404 and that is a great things to have. Food and bar greta and also the gym. I would recommend this to all friends. The bar was London prices for drinks. 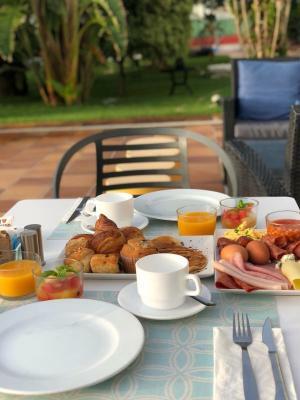 - breakfast : fresh various breads but not in sufficient quantities - rooms : need to be refreshed and better soundproof - I've heard the AxelBeach Hotel is put up for sale; really ? The pool wasn’t heated and it was very cold to get into and stay in. The bed was extremely comfy and the shower was spacious and strong. 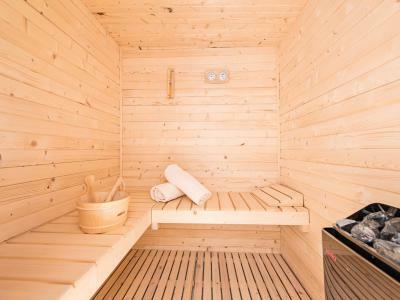 The rooms are really old , the steaming rom ( fits 3 people was broken ) the dry sauna is to small ( fits 3 people) the rooms noisy as the walls are not well isolated. 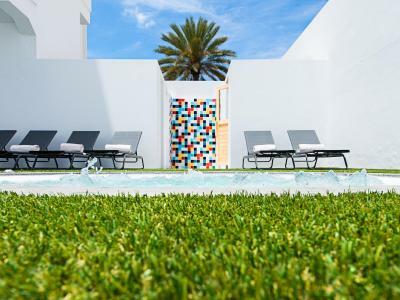 Good location in the heart of playa inglés. The pool is great. Staff is very friendly, Ivan and Antonio were super kind. Value for money is ok. 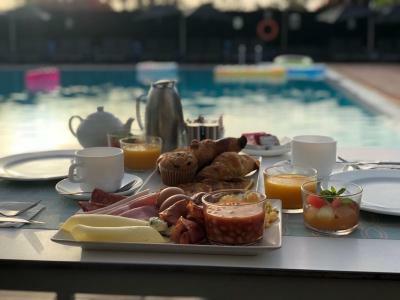 The breakfast was ok.
What I liked the most is to get an upgrade into the Swimmingpool view rooms and to have a king size bed. 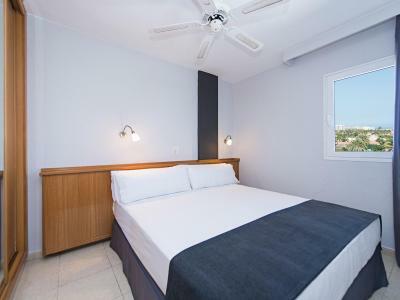 Bed, specifically the mattress, and the rooms are very small, but it is priced accordingly. 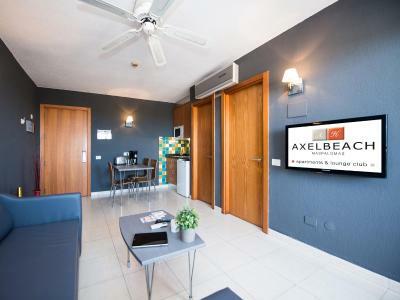 I always stay at the Axel when visiting Maspalomas. 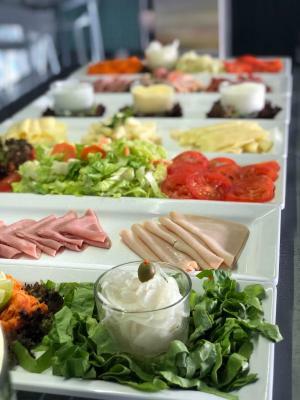 The location is really good, barely a 3 minute walk from the Yumbo centre, the facilities are good and the staff is what really makes a difference. Special mention to Ivan for going the extra mile to make our stay outstanding. Totally exceeded our expectations! Great atmosphere here, Ivan was very friendly and welcoming! Loved our apartment. Music at the pool was great, drinks very good, the sauna and jacuzzi were great! Really looking forward to staying here again!